This straightforward and practical guide outlines a strategic approach to public involvement in government decision making. Prepares public managers for the difficult task of involving citizens more fully in the affairs of government while maintaining effectiveness and efficiency. 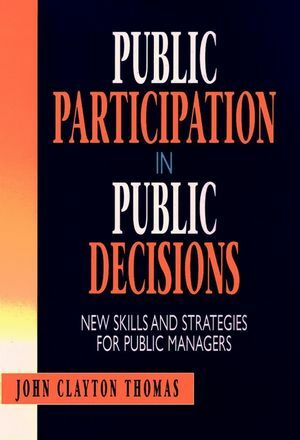 Written in easy-to-understand terms, Public Participation in Public Decisions presents the Effective Decision Model of Public Involvement that managers will find to be an invaluable asset when making decisions about when and how to involve the public. JOHN CLAYTON THOMAS is professor and director of the School of Public Administration and Urban Studies at Georgia State University. He has held leadership posts in several urban affairs and public administration organizations: he served as president of the Urban Affairs Association from 1990--1992 and was program co-chair for the 1994 National Conference of the American Society for Public Administration. He is the author of Between Citizen and City (1986), and Big City Politics in Transition (1991). 1. The Challenge of the New Public Involvement. 2. Finding a Practical Approach to Public Involvement. 3. First Steps in Public Participation in Decision Making. 4. Defining the Relevant Publics. 5. Sharing Decision-Making Authority with the Public. 6. Involving the Public for Information Only. 7. Involving the Public to Build Acceptance. 8. Building Strong Relationships with Citizens. 9. New Forms of Public Involvement. 10. Public Involvement and the Effective Public Manager. Appendix: A. Testing and Refining the Effective Decision Model. Appendix: B. Public Involvement Cases.